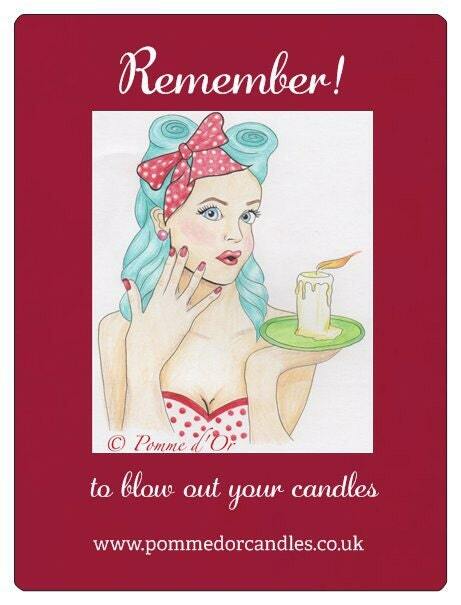 Ever stuck a note to the door to remind yourself to blow out your candles before you go out or up to bed at night? Or you do you simply rely on your memory? Neither method works great for me so i've designed an attractive, retro-style door hanger to act as prompt. The glossy drawing is an original design, created exclusively for Pomme d'Or. 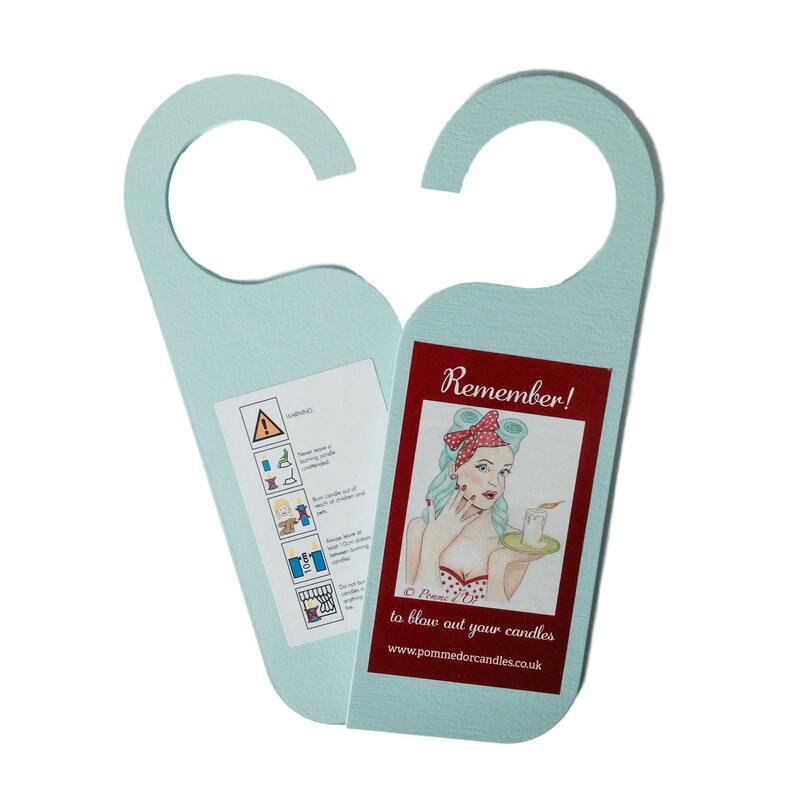 The wooden hanger, painted in Duck Egg Blue, can be hung on the front door, bedroom door, kitchen cupboard ... pretty much anywhere where it will act as a visual reminder. Pictorial candle warnings on the reverse of the hanger also serve to act as a safety reminder. Enjoy the ambience your candles create but most importantly, keep safe. Dimensions approx. of each hanger: 200 x 70 x 3mm. I accept PayPal, Credit Card and Debit Card payments. If your order is a gift going directly to the recipient, I can include a personal message card from you for no extra charge. If you would like this service please let me know what you would like me to write (maximum characters 255) in the "Note to PommeDorGiftIdeas" box during checkout. I ship to UK addresses only using 2nd class Royal Mail which normally takes 2-3 working days. I do not ship with tracking as standard. Once posted I cannot be held responsible if an item gets lost in transit. I always obtain proof of postage and should an item be lost, then I will submit a claim to Royal Mail on your behalf. Royal Mail do not consider anything lost until 15 working days have passed since the item was posted. Should you need to return an item to me, please contact me to let me know along with the reason for return. Please note that I can only accept returned items if they are unused, unopened and still in their original packaging. I do not refund the postage for returned items; any postage cost associated with the return is to be covered by the buyer. Returns should be made within 7 working days of delivery and include the buyer's name. Provided the item is returned in tact as described above, the item will then be refunded once the return has been received. What do you need to be aware of regarding health & safety? Pomme d'Or bath bombs are intended for adults and children over the age of 3. All toiletry products are made by hand and with care and attention to detail in the Pomme d'Or workshop. They comply with current EU legislation. Ingredients are listed on the product wrapper, or, where an item is sold loose, then supplied to you on a separate leaflet. In addition, ingredients are listed as part of the item description on Etsy. Whilst I will give advice where possible, I am unable to give any medical advice. It is the customers responsibility to read the list of ingredients to ensure they are suitable for any underlying medical issues or allergies they may have. Indeed, the same conditions apply should the customer give the product to someone else as a gift. During pregnancy, the use of most essential oils and fragrance oils in bath bombs, which will be diluted in the bath water of course, should be safe (that is as long as the inhalation is not constant or used in a poorly ventilated bathroom). As with most toiletry items, the key is volume used. If you are unsure as to whether an oil is safe to use during pregnancy, seek medical advice and directions from a reliable source before using the product. It is the responsibility of the individual to check with a professional before using any products that may interfere with drugs or medical conditions. Pomme d'Or accepts no responsibility for incorrect use of products and for not following instructions. READING SAFETY INSTRUCTIONS SAVES LIVES! 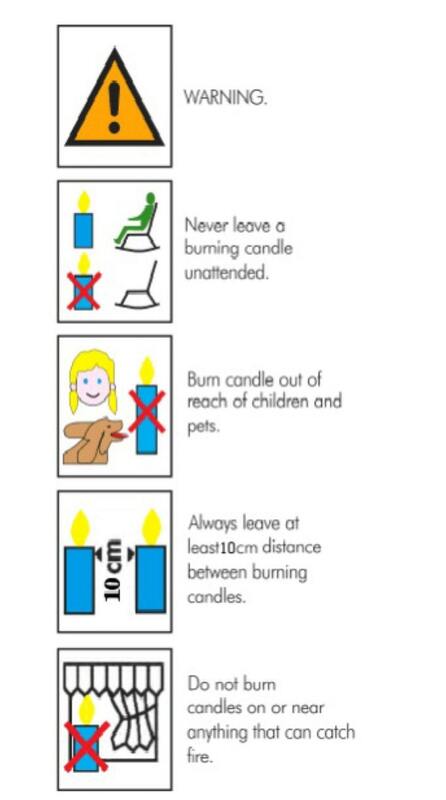 Please remember when you use your candle that you will be dealing with an open flame which increases the risk of fire and damage to your home. Therefore, please take time to read the safety precautions as highlighted in the document which will accompany your candle purchase, and there will also be safety warnings on the candles themselves. Pomme d'Or candles are intended for use by responsible adults.